Christopher Patrick Hussey Murphy received some instruction in art as a child and pursued the practice of art throughout his life. Whenever possible he visited art galleries in Washington, Boston and New York. He subscribed to the two English magazines, “Colour” and “International Studio”, illustrated with excellent color reproductions of old masters and of the modern movement. He collected books on art. Watercolor dominates in his work, but he also produced in oil, charcoal, pastels and portraits in conte earth colors, studying the drawings of the Italians and of the Germans, Hans Holbein, who usually drew his subjects in delicate chalk before painting the final portrait in oils. C.P.H. Murphy cultivated friendships with many artists who came to Savannah to teach or to visit at the Telfair Acad. Of A&S. Among them, Hilda Belcher, Eliot Clark, Adolphe Blondheim, Jean Flanigen, and Edward Shorter. Brenda Putnam, sculptor, modeled a head in clay for an audience at Telfair. Mr. Murphy was the model. The final cast in plaster is in the Perry Street Studio. 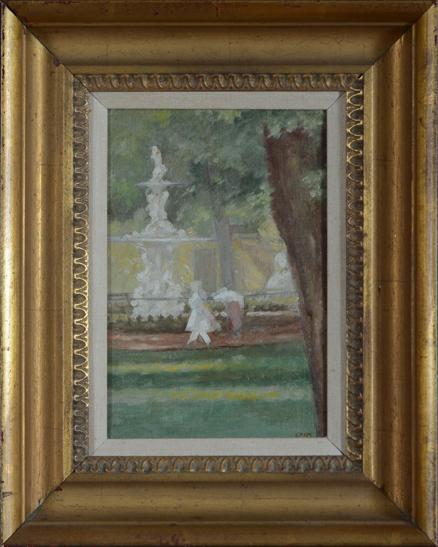 His work was exhibited in annuals of the New York Water Color Club, The American Watercolor Club. The Washington and in the Sixth International at the Art Exposition, Institute of Chicago, 1926 in the Sesquecentennial Exposition, Phila. 1927, four pictures hung. C.P.H.M. and his son C.A.Murphy were leaders in extablishing the Savannah Art Club and the Southern States Art League. His name is listed in “Who’s Who” of 1927. A high point in his education was participating in the 1915 classes of Eben Comins at Gloucester, Mass. Subject matter is of considerable range, Landscape, River Scenes, Savannah and Buildings. Subjects in New York, Washington, Gloucester, North Carolina, portraits and still life. In 1912, after rebuilding of Catholic Cathedral, St. John the Baptist, following disastrous fire in 1898, Christopher P.H. Murphy with a N.Y. firm of artists planned the murals which adorn the interior. He also devised a careful color harmony in the spirit of the French Gothic Construction to harmonize with the stained glass windows and coordinate with the murals. He designed and painted on the walls of the Apse behind the main alter angel musicians in the manner of Fra Angelico. Artist First Name Christopher P.H.